The Almond Road Group in the northeastern New River belt comprises two formations: the basal Snider Mountain Formation contains orthoquartzite, feldspathic quartzite, and quartzite pebble conglomerate; the gradationally overlying Ketchum Brook Formation is composed of feldspathic sandstone, laminated dark siltstone and shale, overlain by mafic lithic tuffs and basaltic flows. The Almond Road Group overlies latest Ediacaran to earliest Cambrian (early Fortunian) pyroclastic, volcaniclastic, and epiclastic rocks of the Belleisle Bay Group. Based in part on this relationship, the Almond Road Group was thought to be Early Cambrian, although an upper age limit had never been determined. A U–Pb (zircon) age of 475 ± 2 Ma for the West Scotch Settlement porphyry, a small felsic hypabyssal intrusion emplaced into the Ketchum Brook Formation, demonstrates that the Almond Road Group is no younger than Early Ordovician (early Floian) age. Its age is further constrained by LA ICP-MS detrital zircon data from a basal quartzite in the Snider Mountain Formation. Results show a dominant peak in the Ediacaran (ca. 575 Ma), with the youngest coherent cluster of ages at ca. 530–520 Ma. Together these data support a Cambrian age for the quartz-rich Almond Road Group and its platformal relationship to Ganderia. Le groupe d’Almond Road, dans la ceinture nord-est de New River, comporte deux formations : la formation basale de Snider Mountain, qui contient de l’orthoquartzite, du quartzite feldspathique et un conglomérat de cailloux de quartz; la formation de Ketchum Brook, progressivement superposée et composée de grès feldspathique, de siltite feuilleté foncé et de schiste superposé de tuf lithique mafique et de coulées basaltiques. Le groupe d’Almond Road repose sur des roches pyroclastiques, volcanoclastiques et épiclastiques allant de l’Édiacarien tardif au Cambrien précoce (Fortunien précoce) du Groupe de Belleisle Bay. En raison en partie de cette relation, on estimait que le groupe d’Almond Road datait du Cambrien précoce, quoique la limite d’âge supérieure n’ait pas été déterminée. Une datation U-Pb (zircon) de 475 ± 2 Ma pour le porphyre de West Scotch Settlement, une petite intrusion felsique hypabyssale à position fixe de la formation de Ketchum Brook, montre que le groupe d’Almond Road ne date pas d’avant l’Ordovicien précoce (Floien précoce). Les données tirées du zircon détritique d’un échantillon de quartzite basal de la formation de Snider Mountain par spectromètre de masse à plasma inductif à ablation par laser restreignent l’âge davantage. Les résultats indiquent un sommet dominant pendant l’Édiacarien (environ 575 Ma), la plus jeune grappe d’âges cohérente étant d’environ 530 à 520 Ma. Mises ensemble, ces données appuient l’âge du Cambrien pour le groupe d’Almond Road riche en quartz, de même que sa relation avec les plates-formes du Gandérien. 1 The New River belt (NRB) is the westernmost of three Proterozoic lithotectonic belts within the broader northeastern Appalachian orogen in southern New Brunswick (Fig. 1). These Proterozoic belts represent the peri-Gondwanan microcontinents of Ganderia and Avalonia (Barr and White 1996b; Fyffe et al. 2009, 2011; Johnson et al. 2012; van Staal and Barr 2012; Barr et al. 2014a, b). The easternmost Proterozoic rocks are in the Caledonia belt, which is the only belt in southern New Brunswick assigned to Avalonia (Barr and White 1996a). The Brookville and New River belts are interpreted to be part of Ganderia; these rocks form the basement to younger, Early Paleozoic arcs (Penobscot and Popelogan-Victoria) and back-arc complexes (Tetagouche-Exploits) exposed in south-central, central and northern New Brunswick, and central Newfoundland (van Staal et al. 2003; Wilson 2003; Hibbard et al. 2006; Zagorevski et al. 2010; Fyffe et al. 2011). The succession of Proterozoic rocks in the NRB and Caledonia belt are similar in that both contain Ediacaran volcanic and comagmatic rocks that formed in two separate pulses, one around ~ 625 Ma and a later one at ~ 555 Ma, and both lacking rocks representative of the ~70 million year hiatus. The Brookville belt that now separates the NRB and Caledonia belt shares only the later Ediacaran magmatic episode (~ 555 Ma) and includes an older ~ 650 Ma carbonate platform signifying a Late Cryogenian passive margin believed to have developed separately from Avalonia (Barr et al. 2014c). Figure 1. Major geological subdivisions in southern New Brunswick showing the distribution of Neoproterozoic, Cambrian to Ordovician and Silurian belts. Area outlined in black is location of Figure 2. Inset map shows major tectonic elements of the northeastern Appalachians in New England and Atlantic Canada. List of fault abbreviations: BF – Belleisle; CCHF – Caledonia-Clover Hill; FF – Fanning Brook KF – Kennebecasis; OBF – Oak Bay; SBF – Sawyer Brook TBF – Taylors Brook. 2 The NRB belt extends from islands in Head Harbour Passage in the Bay of Fundy and trends northeast to the headland west of Maces Bay on mainland southern New Brunswick where it continues inland for a distance of over 160 kms (Figs. 1, 2). The NRB is truncated to the east by the Belleisle Fault, which separates it from the Early Silurian volcanic rocks of the Kingston Group (Figs. 1). The Kingston Group, and partially time-equivalent Mascarene Group that in New Brunswick is preserved within the NRB, represent an Early Silurian arc and back-arc complex, respectively, which were built on NRB Proterozoic basement and the overlying Early Paleozoic arc/back-arc complexes during an episode of northwest-directed (NW-dipping) subduction (Fyffe et al.1999; Barr et al. 2002). To the northwest, the NRB is juxtaposed against Cambrian to Ordovician rocks of the St. Croix and Annidale belts along the Sawyer Brook and Taylor Brook faults, respectively. To the southwest, the NRB trends toward coastal Maine where the Proterozoic rocks are likely to underlie the Cambrian Ellsworth Schist and Castine Volcanics of the Ellsworth belt (Fyffe and Fricker 1987; Schulz et al. 2008; Fyffe et al. 2009). Figure 2. Simplified geological map of the northeastern New River belt and Annidale belt. Numbers in boxes are U–Pb (zircon) crystallization ages from Johnson et al. 2012 and this study. Fault abbreviations as in Figure 1. 3 The NRB is typified by (1) Neoproterozoic arc-related, comagmatic volcanic and plutonic rocks of early Ediacaran (ca. 629–622 Ma) and late Ediacaran (ca. 555–551 Ma) age (Johnson and McLeod 1996; Johnson 2001; Johnson and Barr 2004), (2) latest Ediacaran–earliest Cambrian (ca. 540 Ma) relatively shallow marine to subaerial pyroclastic volcanic and sedimentary rocks of the Belleisle Bay Group and (3) post-540 Ma cover of Cambrian marine sedimentary and minor volcanic rocks. The Cambrian cover rocks occur in three separate structural panels that subparallel the northeasterly strike of the belt, with the most inboard panel being closest to the Kingston belt, and the most outboard panel closest to the Annidale belt (Johnson 2001; Johnson et al. 2009; Fyffe et al. 2011). From farthest inboard to farthest outboard these younger Cambrian rocks are divided into the Saint John, Almond Road, and Ellsworth groups, respectively. All three sequences are either directly underlain by the Belleisle Bay Group, as is the case with the Almond Road Group and Saint John Group in the Long Reach area, or linked to the Belleisle Bay Group by means of detrital zircon as is the case for the Ellsworth Group (Fyffe et al. 2009). Although the quartz-rich Almond Road Group was not previously dated, it was considered to be approximately the same age as the Matthews Lake Formation of the Ellsworth Group and Glen Falls Formation of the Saint John Group (e.g., Fyffe et al. 2011; fig. 4). The age of orthoquartzite and quartzose sandstone in the Matthews Lake Formation, the lower unit of the Ellsworth Group in the NRB, is constrained by earliest Cambrian detrital zircon in the basal beds (Fyffe et al. 2009) and a ca. 514 Ma U–Pb age for the overlying volcanic rocks (McLeod et al. 2003). The Early Cambrian age for orthoquartzite in the Glen Falls Formation, in the lower part of the Saint John Group, is also fairly well-constrained by dated ash beds, macrofossils, and acritarch assemblages in overlying and underlying formations (e.g., Tanoli and Pickerill 1988; Landing et al. 2008; Palacios et al. 2011, 2017), but the age of the Almond Road Group was poorly constrained until now. 4 We report new U–Pb (zircon) data that provide upper and lower age limits on the Almond Road Group. The maximum age of the basal quartzite in the group is Early Cambrian (late Fortunian), based on the youngest concordant detrital zircon population at ca. 530 Ma. The minimum age is Early Ordovician (early Floian) based on a U–Pb age of ca. 475 Ma for the cross-cutting West Scotch Settlement porphyry. Together these data support previous interpretations that Early Cambrian quartz-rich strata in the Ellsworth, Almond Road, and Saint John groups once formed a continuous, distal to proximal, Ganderian sandstone facies spanning all three structural panels of the NRB (Johnson et al. 2009; Fyffe et al. 2011) and may have extended across the Avalonian Caledonia belt as well. 5 The northeastern NRB is defined here as the structural panel between the Belleisle and Taylor Brook faults, west of Belleisle Bay and northeast of the Long Reach (Fig. 2). The Taylor Brook Fault shows evidence that it was initially a thrust fault that has been cut by a late steep structure that presently defines a large part of the boundary between the NRB and Annidale belt. With the exception of small, local fault-bounded units, the Silurian Mascarene Group is restricted to the area south of the Fanning Brook Fault, along the complexly faulted southern margin of the NRB in this area (Fig. 2). This lack of Silurian cover may be due to the oblique east-northeast-trend of the Fanning Brook Fault, which cuts across the regional northeast structural trend exposing older rocks on its north side (Fig. 1). Consequently this structural panel is the only one in which the basement rocks on the north side of the Mascarene basin are exposed. 6 The stratigraphic succession in the northeastern NRB is composed of the Almond Road Group and underlying Belleisle Bay Group. The Belleisle Bay Group in this area comprises two formations; the Browns Flat and Grant Brook formations. The Browns Flat Formation is not dated, but the overlying and in part laterally equivalent Grant Brook Formation yielded a U–Pb zircon age of 541 ± 3 Ma age for a slightly reworked intermediate to felsic tuff. Previous attempts to date the Grant Brook Formation yielded a maximum age of 542 ± 9 Ma (unpublished data from T. Krogh in Johnson et al. 2009), which is considered to be close to the depositional age based on the more recent age data. Historically the vast majority of rocks now included in the Belleisle Bay and Almond Road groups were assigned to the Silurian Mascarene Group (e.g., McCutcheon and Ruitenberg 1987). However, a pre-Silurian age for the Grant Brook Formation is demonstrated by the intense hornfelsing of the unit near the contact with the Early Ordovician (479 ± 2 Ma) Stewarton Gabbro (Johnson et al. 2009, 2012) and the Middle Ordovician (467 ± 3 Ma) age obtained for the crosscutting Bull Moose Hill porphyry (Johnson et al. 2012). 7 The Almond Road Group is divided into the Snider Mountain Formation and overlying Ketchum Brook Formation (Johnson et al. 2009). The group is exposed north of Evandale on the east side of the Saint John River and on Spragg, Taylors and Ketchum brooks near The Grant (Fig. 2). It is also exposed farther northeast on Snider Mountain where it is overstepped by Carboniferous rocks of the Maritimes Basin. 8 The Snider Mountain Formation is named after a section of rocks on Snider Mountain north of Sussex (Figs. 1, 2). On the Snider Mountain Road the formation is composed of white to grey orthoquartzite and intraformational quartzite-pebble-rich conglomerate that appears to be concordantly underlain by pink feldspathic sandstone and pink to reddish arkosic pebble conglomerate of the Grant Brook Formation. There is a gap of a few metres in the exposure, but the quartzite unit contains rare red siltstone clasts presumed to be from the Grant Brook Formation. Along strike to the northeast on Beatty Brook, similar pink feldspathic sandstone and pebbly arkosic conglomerate are succeeded down-section by thick-bedded, volcaniclastic rocks, reworked tuffs, and various pyroclastic volcanic rocks that are also part of the Grant Brook Formation. 9 The Snider Mountain Formation is also well-exposed on a tributary of Jones Brook where is crosses the Almond Road, east of the Saint John River (Fig. 3). Here it is composed of thick-bedded (65–70 cm), white, granular orthoquartzite (Fig. 4), intercalated with thin-bedded, fine-grained, light grey, feldspathic quartzite. The lack of pebble conglomerate at this location may indicate that these strata were deposited farther offshore than those exposed at the type section on Snider Mountain. The quartzite unit is about 20 metres thick and is separated from underlying purple and greyish green ash tuffs of the Grant Brook Formation by a small (< 5 m) concealed zone. The orthoquartzite is succeeded upsection to the south by dark grey siltstone interbedded with fine- to medium-grained, quartz-rich, feldspathic sandstone of the overlying Ketchum Brook Formation on the south side of Almond Road (it should be noted that much of the outcrop on the south side of the road is now covered by rip-rap during 2017 road improvements). Orthoquartzite from this locality on the north side of Almond Road was sampled for detrital zircon. Results are described below in the Geochronology section. Figure 3. Detailed geology of the Almond Road Group type area showing location of sample NB12-313 collected for U–Pb dating. Figure 4. 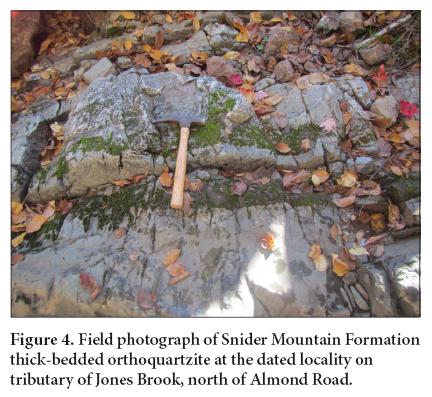 Field photograph of Snider Mountain Formation thick-bedded orthoquartzite at the dated locality on tributary of Jones Brook, north of Almond Road. 10 The Ketchum Brook Formation is characterized by the exposures on Spragg, Taylors and Ketchum brooks (Fig.5), and in the Beulah area and south of Almond Road (Fig.3). The formation is divided into a lower sedimentary member and an upper mafic volcanic member. The sedimentary rocks comprise light grey, thin- to thick-bedded (5–50 cms), fine- to medium-grained, slightly micaceous, quartz-rich, feldspathic sandstone intercalated with dark grey to black laminated siltstone and shale and minor thinly-laminated, light green siltstone, and shale. Near Beulah on a west-flowing tributary of Jones Brook the dark shale dominates and it is interbedded with rare limestone and calcareous siltstone with well-developed cone-in-cone structures. Cone-in-cone structures are diagenetic concretionary features resembling horn corals. Younging direction determined from the cone-in-cone structures show that the clastic rocks are overlain by the mafic volcanic rocks. Intercalations of dark shale and mafic tuff can be viewed on Highway 705 southeast of Beulah (Fig. 3). The mafic volcanic member comprises light grey, commonly bleached, highly amygdaloidal basalt flows and grey green, basaltic lithic tuff dominated by coarse mafic volcanic lapilli. Figure 5. 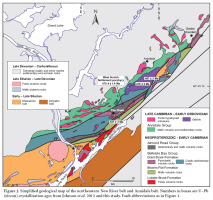 Detailed geology of the West Scotch Settlement area showing the location of sample NB09-03. 11 On Ketchum Brook south of the second bridge on Elm Flat Road only the lower sedimentary member is exposed and here is composed of thick-bedded (40–50 cm), light grey, medium-grained, micaceous, quartz-rich feldspathic sandstone, with thinner (2 cm) interbeds of finer grained, light grey quartzose sandstone and thinly laminated, light green siltstone and shale. To the north on Taylors Brook, it grades upwards into interbedded dark grey to black laminated siltstone and light grey, very fine-to medium-grained, micaceous, feldspathic sandstone. Sandstone beds range in thickness from about 2–20 cm. The Ketchum Brook Formation is intruded by a small number of mostly unnamed, felsic and mafic intrusive plugs and rhyolite domes. 12 The West Scotch Settlement porphyry is a small, hypabyssal felsic intrusion that is less than 1 kilometre in diameter. The intrusion is exposed on Elm Flat Road approximately 2.4 km north of its junction with the West Scotch Settlement Road and on Taylor Brook where it intrudes the Ketchum Brook Formation (Fig.5). The West Scotch Settlement porphyry has abundant euhedral to anhedral feldspar and quartz phenocrysts in an aphantic matrix. The intrusion exhibits a rusty weathered surface due to the presence of iron-oxide from abundant disseminated pyrite. The feldspar phenocrysts and feldspar in the groundmass are pervasively altered to buff white clay. The intrusion is exposed sporadically along Taylors Brook for about 500 metres north of the junction with the Elm Flat Road, at which point it intrudes dark siltstone and white sandstone of the Ketchum Brook Formation. The intrusion–sediment contact is very irregular and dark sedimentary fragments are incorporated into the intrusion at the contact, which is brecciated and contains quartz veins with pyrite. 13 Sample NB09-03 (UTM 20T –5063608 N, 277333 E) was collected from outcrop on the west side of Elm Flat Road where it turns and crosses over Taylors Brook (Fig.5). 14 U–Pb analyses were conducted by Greg Dunning at the Geochronology Laboratory in the Department of Earth Sciences at Memorial University of Newfoundland using chemical abrasion - thermal ionization mass spectrometry (CA-TIMS) methods. The analyses were carried out according to the technique outlined in Sánchez-García et al. (2008). The zircons were annealed, and then etched using the Mattinson (2005) technique, which is very effective at eliminating altered portions of zircon that have undergone lead-loss. The ages were calculated using the decay constants recommended by Jaffey et al. (1971). The U–Pb isotopic composition is shown in Table 1. Table 1. 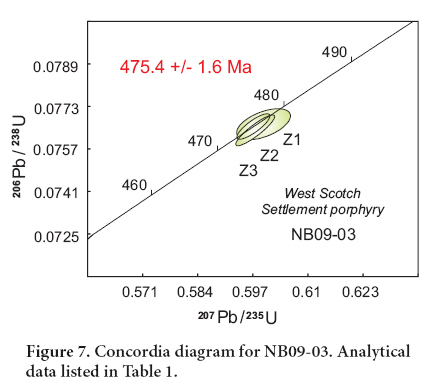 U-Pb isotope composition and age for West Scotch Settlement intrusion (NB09-03). 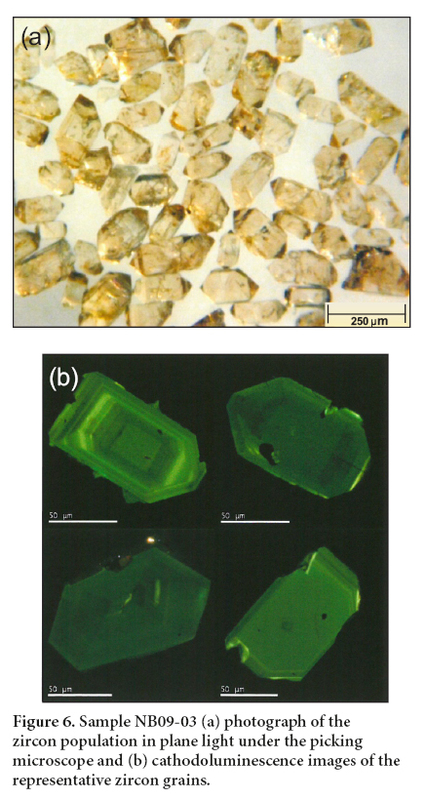 15 The zircon population in plane light under the picking microscope and the cathodoluminescence images of the representative grains are shown on Figures 6a and 6b. The sample has three concordant points of 3–5 zircon prisms each (Fig. 7). The three points yield 206Pb/238U ages as follows: Z1 – 476 ± 3; Z2 – 475.5 ± 2.3; Z3 – 474.6 ± 3 Ma. The weighted average of these at the 95% confidence interval is 475.4 ± 1.6 Ma (MSWD = 0.24) indicating an Early Ordovician (Floian) age for the West Scotch Settlement porphyry. Figure 6. Sample NB09-03 (a) photograph of the zircon population in plane light under the picking microscope and (b) cathodoluminescence images of the representative zircon grains. Figure 7. Concordia diagram for NB09-03. Analytical data listed in Table 1. 16 Sample NB12-313 (UTM 19T – 5054899 N, 731021 E) was collected from orthoquartzite outcrop on a tributary of Jones Brook less than 20 metres north of where it crosses the Almond Road (Figs. 3, 4). Detrital zircon from the sample is shown in Figure 8. Figure 8. 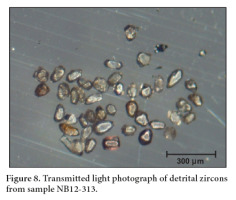 Transmitted light photograph of detrital zircons from sample NB12-313. 17 Detrital zircon U-Th-Pb laser-ablation, inductively coupled plasma mass spectrometry (LA-ICPMS) analyses were conducted at the Texas A&M University R. Ken Williams Radiogenic Isotope Geosciences Laboratory. Rock samples were crushed and zircon grains concentrated using standard crushing and density separation (jaw and disc crusher, Wilfley table, heavy liquids) methods. Zircon grains were separated from other dense minerals by handpicking in a petrie dish under a binocular microscope, but no further separation was performed on the bulk zircon aliquot recovered from heavy liquids. The bulk zircon aliquot was piled and quartered repeatedly in the petrie dish to obtain an unbiased (or minimally biased) sub-sample of about 1000 grains. This zircon sub-sample was mounted on double-stick tape and encased in a 2.5cm diameter epoxy disc, along with fragments of NIST 610, NIST 612, one primary reference material (zircon 91500; Wiedenbeck et al. (1995) and two secondary reference materials (zircons R33 and FC-1; Black et al. 2004; Paces and Miller 1993, respectively). The disk was abraded with 2000 grit sandpaper to expose the interior of zircon grains and polished to 0.25µm on a diamond-suspension lap wheel. 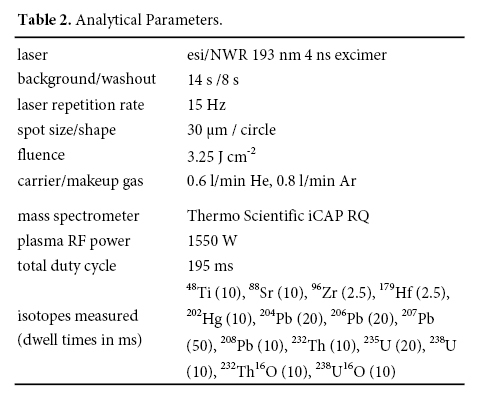 18 LA-ICPMS analyses were conducted on a Thermo Scientific iCAP RQ quadrupole mass spectrometer running in standard high-sensitivity (STDS) mode connected to an esi/NWR 193nm 4ns pulsed excimer laser system equipped with a two-volume sample cell (TV-2). 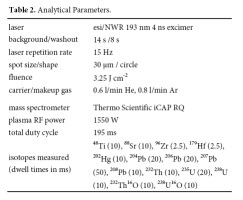 Instrument settings and run parameters are given in Table 2 and analytical data in Appendix A. Data are reduced using Iolite v. 3.5 (Paton et al. 2011) under the U–Pb Geochron4 data reduction scheme (Paton et al. 2010). Analysis of the primary reference material, each treated separately as an unknown, indicates an internal analytical reproducibility of U–Pb ages to better than 0.7%. The average accuracy of secondary reference materials (Appendix A) is better than 2.25% (FC-1) and better than 1.5% (R33). 19 A total of 177 zircon grains were analyzed from sample NB12-313. A gap in dates at around 700 Ma provides a convenient cut-off below which the 206Pb/238U dates are preferred and above which the 207Pb/206Pb dates are preferred. 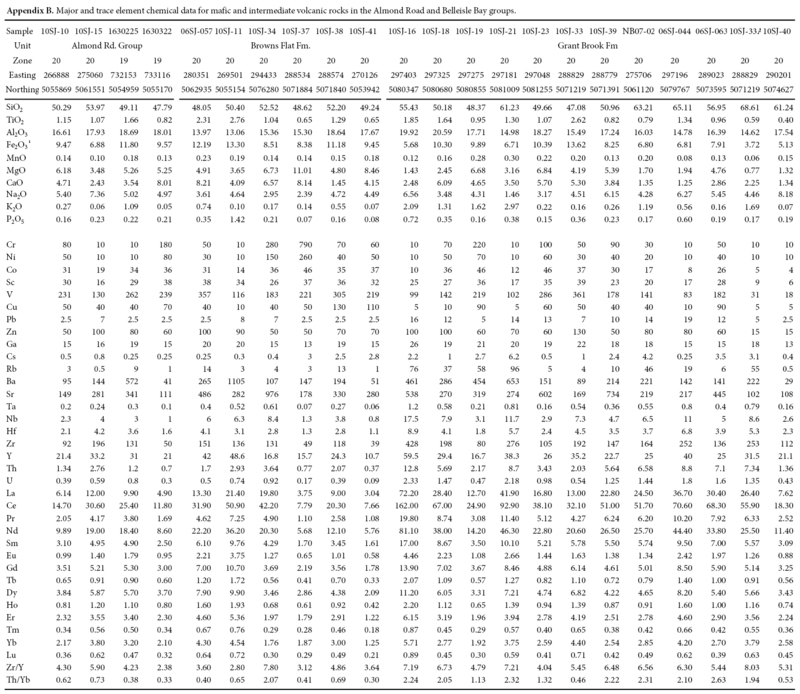 Of the analyzed grains, 51 were either >10% discordant or were of <10% precision on their preferred U–Pb date. The age spectrum is dominated by a peak centered at about 575 Ma (Fig. 9a). It is important to note that in a detrital suite it is unlikely that these represent a single population of zircon; therefore at least some of the individual analyses that cluster around 575 Ma may actually be younger, within error of the 560–550 Ma volcanic and co-magmatic plutonic rocks now exposed in the NRB. The apparent youngest grain has a 206Pb/238U age of 515 ± 5.5 Ma, (Fig. 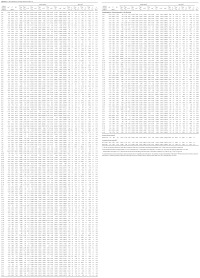 9b, Appendix A) but it lies within error of a fairly continuous distribution of dates with no clear “cluster” of youngest dates and thus the data do not provide clear evidence for providing a quantifiable maximum age of deposition. The youngest population of zircons yielded a Concordia age of 529.2 ± 3.6 Ma indicating a depositional age of ca. 530 Ma or younger (Fig. 9c). Figure 9. Sample NB12-313 (a) Relative probability plot and histogram and (b) age distribution of the youngest detrital zircons. (c) Concordia plot of the youngest detrital zircon population. Box heights in b are 2σ. Analytical data are listed in Appendix A. 20 A total of 22 samples of mafic to intermediate volcanic rocks were chosen for analysis. 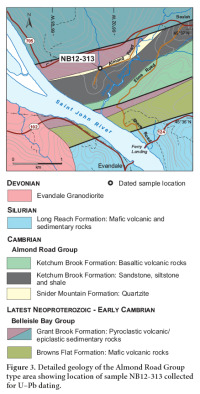 The sampled units include the Ketchum Brook Formation in the Almond Road Group (4 samples), and the Grant Brook (12 samples) and Browns Flat (6 samples) formations in the Belleisle Bay Group. The majority of volcanic rocks in the Browns Flat and Ketchum Brook formations are basalt, whereas the composition of the Grant Brook Formation volcanic rocks is mainly andesitic or basaltic andesite (Fig. 10a). Three of the analysed samples from the latter formation contained > 63% SiO2 (Appendix B), although only one of these plots in the rhyolite- dacite field based on immobile trace element ratios (Fig.10a). 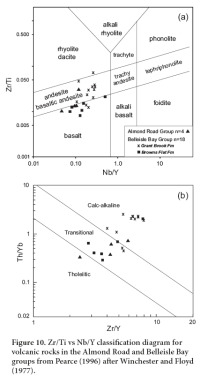 Immobile trace element ratios were also utilized to determine the magmatic affinity of the volcanic rocks in the northeastern NRB (Fig. 10b). The Th/Yb against Zr/Y bivariate diagram of Ross and Bedard (2009) was chosen as these authors have demonstrated that it is an improvement on Barrett and McLean’s (1994, 1999) single ratio diagrams using Zr versus Y, La versus Yb and Th versus Yb, although the data are still somewhat ambiguous. The basalt in the Browns Flat Formation plot almost exclusively in the transitional field, although one sample was clearly calc-alkaline (Fig. 10b). Basalt samples from the Ketchum Brook Formation are similar in that the four samples span the tholeiitic, transitional, and calc-alkaline fields. The one tholeiitic sample in the Ketchum Brook Formation was collected from the same general area as another that plots well into the transitional field but the reason why the trace element ratios are so different is not clear. In contrast, the Grant Brook Formation is clearly calc-alkaline based on Th/Yb and Zr/Y ratios (Fig. 10b). Figure 10. Zr/Ti vs Nb/Y classification diagram for volcanic rocks in the Almond Road and Belleisle Bay groups from Pearce (1996) after Winchester and Floyd (1977). 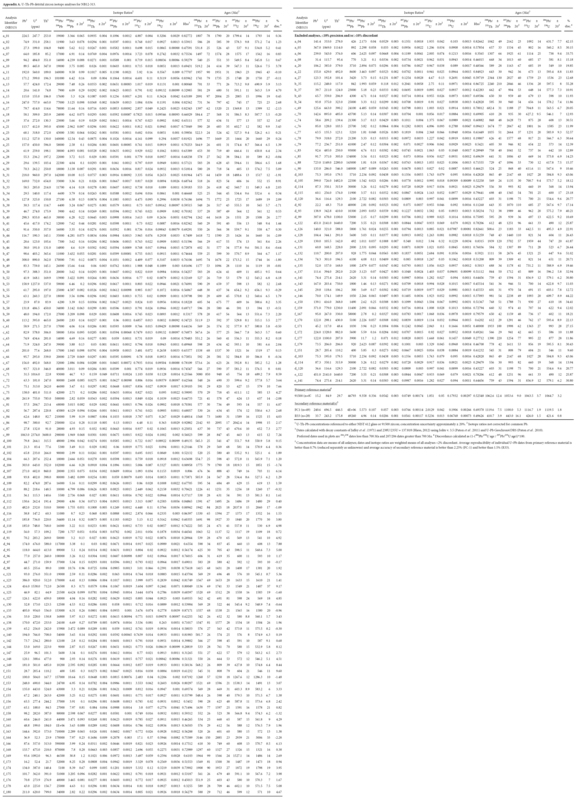 21 On N-MORB-normalized trace element spider diagrams all of the samples exhibit depletion in Nb relative to Th or La (Fig. 11) that is typical of arc magmas. The Belleisle Bay Group exhibits three slightly different patterns that correlate directly with the composition of the volcanic rocks. As would be expected the most felsic samples in the Grant Brook Formation show the most pronounced depletion in Ti (Figs. 11b, 11c, and 11d). Basalts from the Browns Flat and Grant Brook formations are similar and lend support to the field evidence that suggests these formations are in part laterally equivalent. The younger Ketchum Brook Formation basalt samples exhibit patterns similar to those in the Belleisle Bay Group and are indistinguishable from them based on trace element patterns alone. Figure 11. 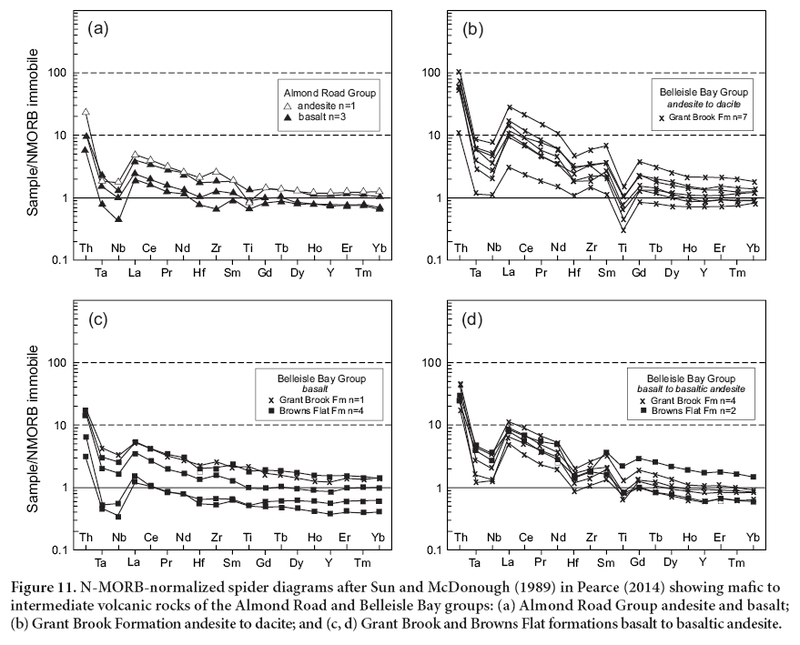 N-MORB-normalized spider diagrams after Sun and McDonough (1989) in Pearce (2014) showing mafic to intermediate volcanic rocks of the Almond Road and Belleisle Bay groups: (a) Almond Road Group andesite and basalt; (b) Grant Brook Formation andesite to dacite; and (c, d) Grant Brook and Browns Flat formations basalt to basaltic andesite. 22 On a tectonic discrimination diagram using high field strength elements such as the Th-Hf-Ta of Wood (1980), all of the volcanic rocks in the Belleisle Bay and Almond Road groups plot in the volcanic arc basalt field (Fig. 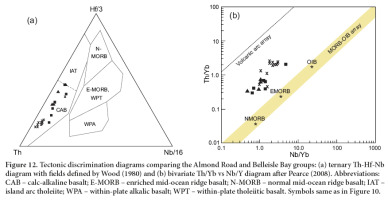 12a) and are displaced above the diagonal line representing mid-ocean ridge basalt (MORB) and ocean island basalt (OIB) on the Th/Yb versus Nb/Yb diagram (Fig. 12b) of Pearce (2008), indicating that they interacted with continental crust or were erupted in a supra-subduction zone environment (Pearce and Peate 1995). Figure 12. 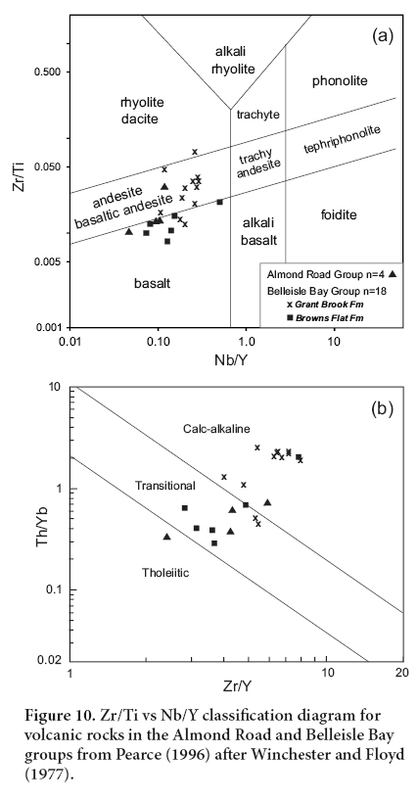 Tectonic discrimination diagrams comparing the Almond Road and Belleisle Bay groups: (a) ternary Th-Hf-Nb diagram with fields defined by Wood (1980) and (b) bivariate Th/Yb vs Nb/Y diagram after Pearce (2008). Abbreviations: CAB – calc-alkaline basalt; E-MORB – enriched mid-ocean ridge basalt; N-MORB – normal mid-ocean ridge basalt; IAT – island arc tholeiite; WPA – within-plate alkalic basalt; WPT – within-plate tholeiitic basalt. Symbols same as in Figure 10. 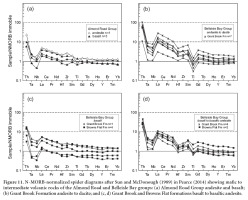 23 Previously published chemical data for the Belleisle Bay Group to the southwest in the Long Reach area (Johnson and Barr 2004) are compared to the results of this study. The latest Neoproterozoic to earliest Cambrian volcanic succession in the Long Reach area were divided into the Browns Flat and Beulah Camp formations, which were later assigned to the Belleisle Bay Group by Johnson et al. (2009). The Beulah Camp Formation is lithologically similar to the Grant Brook Formation and this correlation is corroborated by the chemical data. Basalts from the Beulah Camp Formation, like those in the Grant Brook were also chemically similar to those in the Browns Flat Formation (Johnson and Barr 2004). Major and trace element signatures in the former indicate that it also was likely erupted in a continental margin subduction zone (Johnson and Barr 2004). The Browns Flat Formation basalts in that area showed two different geochemical trends, one indicative of a within-plate setting and the other exhibiting characteristics of highly unevolved basalts suggesting a complex tectonic history. 24 Early Cambrian quartz-rich clastic sedimentary successions that overlie latest Ediacaran to earliest Cambrian volcanic and volcaniclastic to arkosic sedimentary rocks of the Belleisle Bay Group occur in all three structural panels within the NRB (Fyffe et al. 2011; fig. 4). These quartz-rich successions include the Matthews Lake Formation of the Ellsworth Group, the Snider Mountain Formation of the Almond Road Group, and the Glen Falls Formation of the Saint John Group. The age of the Glen Falls Formation is bracketed by a ca. 530 Ma ash bed from near the base of the underlying Ratcliffe Brook Formation and a ca. 510 Ma ash bed in the overlying Hanford Brook Formation (Landing et al. 1998; Landing and Westrop 1998; Isachasen et al. 1994; Palacios et al. 2011, 2017). A similar age is indicated for the Matthews Lake Formation as the overlying Mosquito Lake Road Formation is ca. 514 Ma (McLeod et al. 2003) and the youngest detrital zircon in the Matthews Lake Formation is ca. 540 Ma, (Fyffe et al. 2009). Although beyond the scope of this paper it is interesting to note the Glen Falls Formation quartzite in the Caledonia Terrane near Saint John shows a nearly unimodal detrital zircon population at ca. 540 Ma (Barr et al. 2012), essentially identical to the population distribution of zircon in the Matthews Lake Formation in the NRB, suggesting a similar source in the Early Cambrian. The age of the Almond Road Group is now bracketed between the Early Cambrian (late Terreneuvian) and Early Ordovician (Tremadocian) indicating that it is possible that all three quartzite sequences in the NRB are Stages 2-3 of the Cambrian (using the time scale of Cohen et al. 2013). 25 The textural maturity and bedforms that characterize the Glen Falls Formation indicate that it was deposited in a near-shore, high energy marine environment (Tanoli and Pickerill 1987; Landing and Westrop 1998). Although detailed sedimentological analysis was not undertaken on the Snider Mountain or Matthews Lake formations preliminary observations suggest a somewhat more distal depositional environment for these rocks. 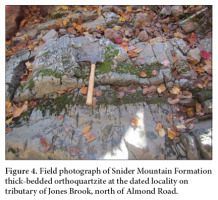 The most obvious is the lack of large-scale trough cross-bedding or other indications of wave action or fluvial processes that would be present in a shallow marine setting and the Snider Mountain Formation on Jones Brook contains no conglomerate at all. Although primary sedimentary features are rarely preserved in the more strongly deformed Matthews Lake Formation, some of the conglomerates have a mud-rich matrix and lithologically varied clasts that may have been deposited as debris flows. The Matthews Lake Formation as a whole tends to be a thicker, somewhat finer grained, quartzose sandstone sequence with local conglomerate debris flows that pass upwards into Mosquito Lake Formation containing sandstone with iron-rich siltstone lenses suggesting deposition in relatively deeper water. This led Fyffe et al. (2009, 2011) to suggest that the Almond Road and Matthews Lake may be more outboard facies of the tidally-influenced quartzite of the Glen Falls Formation, therefore would represent outer and inner platform sequences, respectively, deposited on NRB basement during the latter part of the Early Cambrian. 26 The arc-like chemistry of the Belleisle Bay Group is similar to the chemistry of mafic volcanic rocks in the upper Almond Road Group and the younger Late Cambrian to Early Ordovician Annidale Group, which occurs in the adjacent lithotectonic belt. The Annidale Group preserves the remains of the Penobscot back arc basin and a record of the Early Ordovician Penobscot orogeny (Johnson et al. 2009; 2012), one of the oldest orogenic events within the Appalachian orogen (Zagorevski et al 2007; van Staal and Barr 2012). 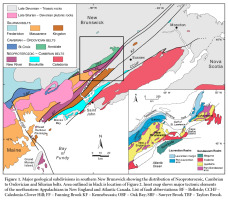 In New Brunswick, the Penobscot back arc basin is interpreted to have developed along a continental margin represented by the Proterozoic rocks of the NRB and Brookville belt (Johnson et al. 2009, 2012; Fyffe et al. 2011). The Ediacaran rocks in these belts are interpreted to represent ensialic arc magmatism along the margin of Amazonia before it separated from Gondwana and became the Ganderian microcontinent (e.g., van Staal et al. 2012 and references therein). The arc signature of the ca. 540 Ma volcanic rocks in the Belleisle Bay Group supports the idea that the NRB was part of this continental margin in the Late Neoproterozoic and earliest Cambrian. The upwards transition from volcaniclastic sandstone and redbeds in the upper part of the Belleisle Bay Group to the widespread occurrence of quartz-rich sedimentary rocks by late Terreneuvian (530– 520 Ma) suggest a rift-to-drift transition, possibly signalling the breakup of Gondwana. In other areas of Ganderia arc magmatism was shut-off at around 540 Ma due to ridge-trench collision that transformed the Gander margin into a strike-slip regime (e.g., Rogers et al. 2006). Exhumation of older rocks within the arc during such a collision could explain the prominence of ca. 575 Ma detrital zircon in the Almond Road Group. Around 515 Ma the NRB underwent renewed arc volcanism as represented by rocks in the upper part of the Almond Road Group and the Mosquito Lake Road Formation (Johnson and McLeod 1996). This magmatism may be related to the development of the Penobscot arc and the formation of the Annidale back-arc basin by the Late Cambrian (ca. 495 Ma) (Johnson et al. 2012). 27 Rocks spanning the time period between the ca. 515 Ma Mosquito Lake Road Formation and ca. 495 Ma Annidale Group are not present in the NRB but they do occur in Maine. The chemical and isotopic data for the ca. 509–502 Ma Ellsworth Schist and overlying Castine Volcanics (Stewart 1998) in Maine show they are not arc-related, but that they likely developed within a proto- oceanic rift, such as in the Gulf of California (Schulz et al. 2008). Fyffe et al. (2009) considered the lithological characteristics of the Ellsworth volcanic sequence in coastal Maine to be similar to the Matthews Lake and Mosquito Lake Road formations in the NRB but the sequences are not temporally equivalent, therefore it remains unclear clear if this accounts for the contrast in tectonic environment or if it is due to along strike differences in an extremely complex long-lived convergent margin such as the Early Paleozoic Gander margin. The authors would like to extend their appreciation to Sherri Furey and Amanda Langille at the U–Pb laboratory at Memorial University Newfoundland and laboratory staff at Texas A&M University. We thank Sandra Barr and Chris White for initiating the detrital zircon project and facilitat-ing the U–Pb dating at Texas A&M and Chris White for providing the Concordia diagram for the Snider Mountain Formation. Journal reviewers Les Fyffe and Doug Reusch made many thoughtful comments that significantly im-proved the manuscript. We also wish to acknowledge Mal-colm McLeod who conducted field mapping in this area and made many contributions to our understanding of the geology. Geochemical data diagrams were produced using Geochemical Data Toolkit (GCDKit). Barr, S.M., Johnson, S.C., and White, C.E. 2014b. The ongoing Saint John geology enigma: Avalonia versus Ganderia in southern New Brunswick. Geological Association of Canada-Mineralogical Association of Canada, Field Trip Guidebook B6,52 p.
Barr, S.M., Miller, B.V., White, C.E., Johnson, S.C., and Fyffe, L.R. 2014c. Age and provenance of detrital zircon in Precambrian–Lower Paleozoic sedimentary units in southern New Brunswick: preliminary results. In Abstracts 2014: Exploration, Mining and Petroleum New Brunswick. Edited by E.A. Keith. 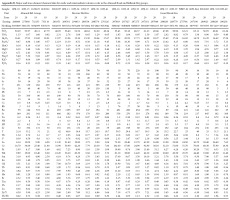 New Brunswick Department of Energy and Mines, Geoscience Report 2014–5, p. 3. Barrett, T.J. and MacLean, W.H. 1994. Chemostratigraphy and hydrothermal alteration in exploration for VHMS deposits in greenstones and younger volcanic rocks. In Alteration and alteration processes associated with ore-forming systems. Edited by D.R. Lentz. Geological Association of Canada. Short Course Notes, v.11, pp. 433–467. Barrett, T.J. and MacLean, W.H. 1999. Volcanic sequences, lithogeochemistry, and hydrothermal alteration in some bimodal volcanic-associated massive sulphide systems. In Volcanic-associated massive sulphide deposits: processes and examples in modern and ancient settings. Edited by C.T. Barrie and M.D. Hannington. Reviews in Economic Geology, 8, pp. 101–131. Cohen, K.M., Finney, S.C., Gibbard, P.L., and Fan, J.-X. (2013; updated) The ICS International Chronostratigraphic Chart. Episodes, 36, pp. 199–204. Hibbard, J.P., van Staal, C.R., Rankin, D.W., and Williams, H. 2006. Lithotectonic map of the Appalachian orogen, Canada — United States of America: Geological Survey of Canada, Map 02096A, 2 sheets, scale 1:1 500 000. Johnson, S.C. and Barr, S.M. 2004. 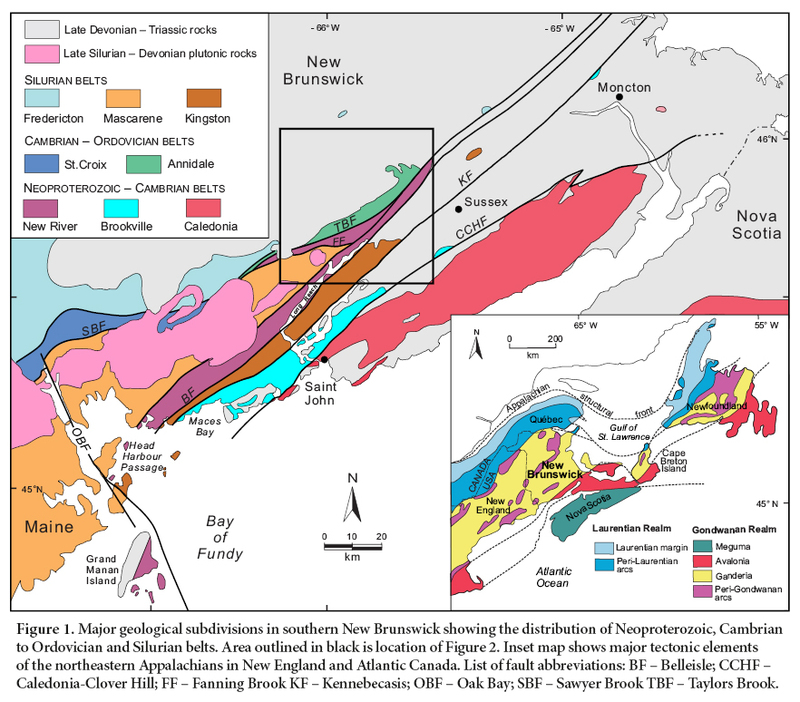 New chemical data from from Neoproterozoic–Cambrian igneous rocks in the Long Reach area, southern New Brunswick. In Geological investigations in New Brunswick for 2003. Edited by G.L. Martin. New Brunswick Department of Natural Resources; Minerals, Policy, and Planning Division, Mineral Resource Report 2004–4, pp. 75–94. Johnson, S.C., McLeod, M.J., Fyffe, L.R., and Dunning, G.R. 2009. 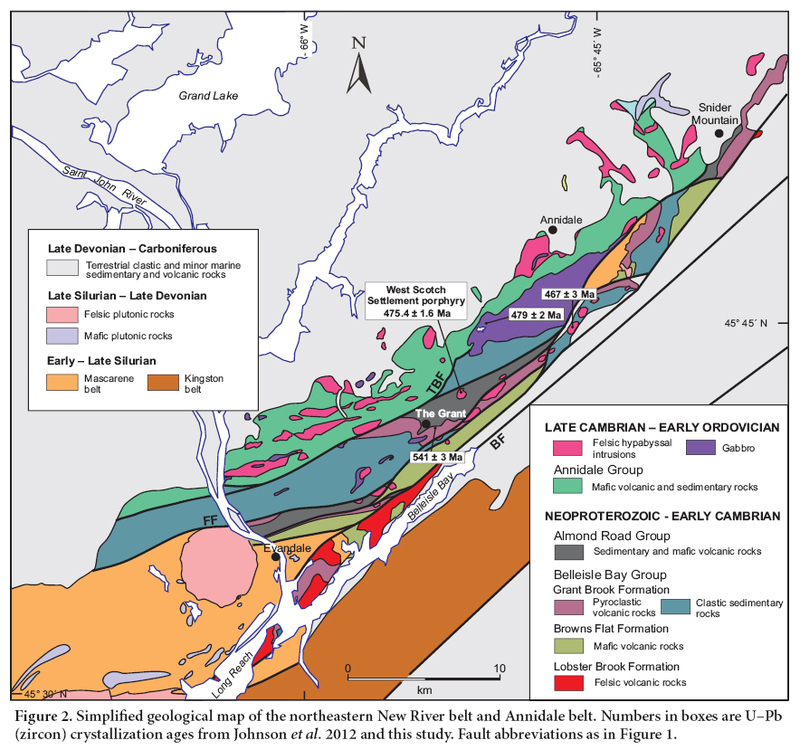 Stratigraphy, geochemistry, and geochronology of the Annidale and New River belts, and the development of the Penobscot arc in southern New Brunswick. In Geological investigations in New Brunswick for 2008. Edited by G.L. Martin. New Brunswick Department of Natural Resources; Minerals, Policy, and Planning Division. Mineral Resource Report 2009–2, pp. 141–218. Johnson, S.C., Fyffe, L.R., McLeod, M.J., and Dunning, G.R. 2012. U–Pb ages, and tectonomagmatic history of the Cambro–Ordovician Annidale group: a remnant of the Penobscot arc system in southern New Brunswick. Canadian Journal of Earth Sciences, 49, pp. 166–188. Landing, E. and Westrop, S. R. 1998. Cambrian faunal sequences and depositional history of Avalonian Newfoundland and New Brunswick: field workshop. In Avalon 1997 – The Cambrian Standard. Edited by E. Landing and S.R. Westrop. New York State Museum Bulletin, 492 p.
McCutcheon, S.R. and Ruitenberg, A.A. 1987. Geology and mineral deposits, Annidale–Nerepis area, New Brunswick. New Brunswick Department of Natural Resources and Energy; Mineral Resources Division, Memoir 2, 141 p.
Palacios, T., Jensen, S., Barr, S.M., White, C.E., and Miller, R.F. 2011. New biostratigraphical constraints on the lower Cambrian Ratcliffe Brook Formation, southern New Brunswick, Canada, from organic-walled micro-fossils. Stratigraphy, 8, pp.45–60. Pearce, J.A. 1996. A user’s guide to basalt discrimination diagrams. In Trace element geochemistry of volcanic rocks: applications for massive sulphide exploration. Edited by D.A. Wyman. Geological Association of Canada/Mineralogical Association of Canada, short course notes, 12, pp. 79–113. Stacey, J.S. and Kramers, J.D. 1975. Approximation of terrestrial lead isotope evolution by a two-stage model. Earth and Planetary Science Letters, 26, pp. 207–221. https://doi.org/10.1016/0012-821X(75)90088-6. Stewart, D.B. 1998. Geology of Northern Penobscot Bay, Maine: U.S. Geological Survey Miscellaneous Investigations Series Map I-2551, 2 sheets, scale 1:62 500. Tanoli, S.K. and Pickerill, R.K. 1987. The Glen Falls Formation – an example of a barrier island retreated by shoreface erosion. Geological Bulletin, University of Peshawar, 20, pp. 1–21. Van Staal, C.R. and Barr, S.M. 2012. Lithospheric architecture and tectonic evolution of the Canadian Appalachians. In Tectonic styles in Canada revisited: the Lithoprobe perspective. Edited by J. A. Percival, F.A. Cook, and R. M. Clowes. Geological Association of Canada, Special Paper 49, p. 41–95. Van Staal, C.R., Wilson, R.A., Rogers, N., Fyffe, L.R., Langton, J.P., McCutcheon, S.R., McNicoll, V., and Ravenhurst, C.E. 2003. Geology and tectonic history of the Bathurst Supergroup, Bathurst Mining Camp and its relationships to coeval rocks in southwestern New Brunswick and adjacent Maine-a synthesis. In Massive sulfide deposits of the Bathurst Mining Camp, New Brunswick and northern Maine. Edited by W.D. Goodfellow, S.R. McCutcheon, and J.M. Peter. Economic Geology Monograph 11, p. 37–60. Appendix A. U-Th-Pb detrital zircon isotope analyses for NB12-313. Appendix B. 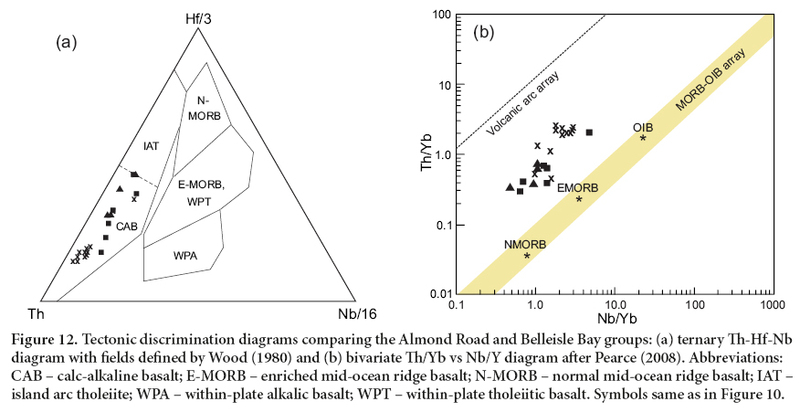 Major and trace element chemical data for mafic and intermediate volcanic rocks in the Almond Road and Belleisle Bay groups.